Hello, my name is Billie! 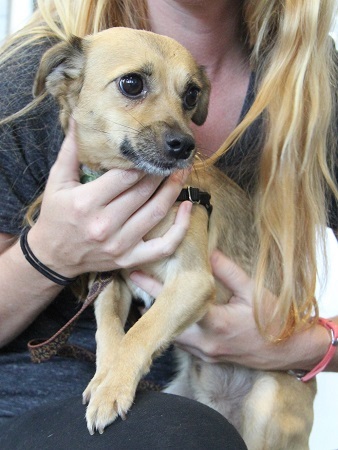 I’m a male 3 year old Terrier/Chihuahua mix looking for a home that will love me and keep me safe. You know, safe from sharks… zombies… giant man-eating squirrels… Ok, so I’m a bit of a worrier, it’s something I’m working on and could really use a confident role model. I’m super snuggly and LOVE to play. I would love to play with your dogs, cats and older kids, just as long as we can stay out of the ocean, and away from possible avalanches, erupting volcanoes and crop circles… Oh bother, there I go again! If you give me a try you will be rewarded with all the love and affection I can offer (which is a LOT! ), there are just some confidence boosting quirks to help me get through at the beginning. Can we work on it together? Fill out the adoption application so we can schedule a meet and greet. I am fixed, vaccinated and microchipped. My adoption fee is $250.